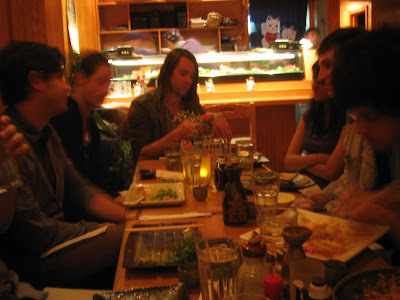 Theres a little magical spot in greenpoint called "sapporo haru," perhaps more commonly referred to as "unlimited sake." This was unsurprisingly the locale of choice for Kip & Kevin's Joint Birthday Dinner. It was a delightful affair and everyone was on their best behavior, patiently waiting and waiting and waiting before eating for caycee's spicy salmon to arrive. Eventually it arrived in the form of friend rice, but hey, close enough. I later suggested in a hushed tone that we order dessert with a birthday candle but the idea was scoffed at like I was some kind of giant loser!! Whatevs. Sorry 4 caring!! I looked it up on the 31 flavs website.... 1000 cals. My birthday isn't far away-- I think I'm gonna save up some points and cash them in for the big prize too.